4ONLINE REGISTRATION CLOSES AT 11:59 PM, ON 11/04/16. HOWEVER, STAY CALM BECAUSE YOU CAN STILL REGISTER ON SITE AT NTC PARK @ LIBERTY STATION STARTING AT 4:00PM ON RACE DAY! 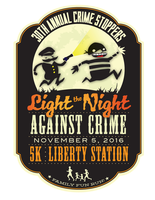 Join us for our 30th Annual Crime Stoppers Light the Night Against Crime 5K! This family friendly event offers lots of fun booths, exhibits and a post-race party with entertainment. Great food and a cop & robber costume contest too! The race course is a flat, fun 5K run/walk in San Diego’s Liberty Station at NTC Park. Every participant receives a 30th annual t-shirt and medal. For more information on becoming an event sponsor or on having a booth at the event, please visit www.sdcrimestoppers.org and click on the Light The Night 5K banner or link. See you at the event! !